A man sits down at a public cafe to write out his proclamation for the greatest eco system that has ever been visioned on this planet. He is calm, focused and clear in his path. Each word echoes through him onto the page, moment by moment coming ever so closer to the greatest message the world has ever seen….and in an instant the weather changes. Like a cool breeze in the heat of a Death Valley Summer, the wind of her essence captivates his every cell. His next thought was the completion of a new evolution of mankind, the answer to all of our suffering was in the completion of one final sentence, but, the sentence has escaped him. His mind is now filled with the scent of a gentle rose petal laced in lavender. The shimmer of her long brown hair beckons his fingers to drop the pen and focus his presence on the greatest gift he has ever seen….A WOMAN. He is hypnotized, and in that same moment as he finished his masterpiece, he connects into her eyes and flashes a whole new existence, the courting, the travel, the long nights of love making, the countless conversations on worldly topics, the house, the children, death. And in that moment his life is forever changed. No longer will he save the world, but he will give his gift to the most beautiful woman that he has ever seen in his life…. 10 minutes later….the weather changes again….this time she is Blonde with…. 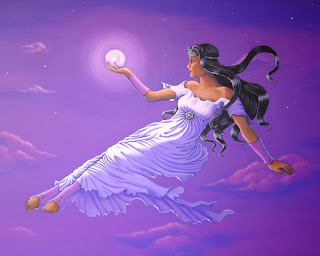 Moral of the story….MEN, MAKE SURE YOUR WORKSPACE IS FREE FROM DISTRACTION….There is none more powerful then the blessed and glorious distraction of a Divine Goddess…..She has the power to HOLD THE MOON in the palm of her hand!